In 2012, Illinois Public Media celebrated its 90th anniversary. WILL-AM, then known as WRM, signs on, broadcasting from the U of I Electrical Engineering Laboratory. The call letters stand for "We Reach Millions." WRM possessed the only two vacuum tubes on campus -- tubes so fragile they had to be cooled by blasts of an electric fan to avert disaster. They were so rare that they were borrowed during off-the-air hours for Professor Joseph Tykociner's pioneer work with sound film. WRM moves to new brick building at the south end of Illinois Field, facing Wright Street, with a new 1,000-watt Western Electric transmitter and tower. The new building was constructed with funds given by Chicago businessman Boetius H. Sullivan in memory of his father. For the next 16 years, the station was known as the "Roger C. Sullivan Memorial Station." Josef Wright becomes the university's first director of broadcasting and director of public information. WRM changes call letters to WILL. WILL hires its first full-time employee, Frank Schooley. He worked for 43 years at WILL, from 1954 to 1973 as director of broadcasting. In the early years, Schooley had to have physical agility as well as radio know-how. To broadcast a classroom lecture, Schooley would set up the equipment, mount the platform to introduce the speaker, handle engineering chores from the studio, and then collect the gear when the lecture was over. The radio station is assigned the frequency of 890 kHz. WILL-AM begins operating on current frequency of 580. Good music has always been a part of WILL's programming. Much of it was broadcast live. In 1937 the station even had its own chamber orchestra, the WILL Sinfonietta. Later, the development of high-quality tape and the long-playing records reduced the use of live music. WILL-AM assumes regular night-time broadcasting. First U.S. FM station begins broadcasting. A young U of I engineer named Jim Ebel personally guided the university into the FM broadcasting business. Ebel built an antenna in the attic of a campus auditorium so he could listen to the state's only FM station, owned by Zenith in Chicago. He became excited about FM's static-free reception. Armed with a basic circuit sketch from a trade magazine, Ebel and fellow WILL engineer Ed Hamilton build WILL-FM's first transmitter. Its 250 watts barely reached beyond Champaign-Urbana. WILL-FM (then known as WIUC) signs on with first FM license to a university. In the early days, FM was so new that WILL-FM had an audience made up of the 15 to 20 people who had access to FM receivers. "The station used to have about six small FM receivers we would loan out upon request," said Jean West, transmitter engineer in the early days. "Sometimes we would go to people's homes and convince them to take a receiver. We wanted people to try us. I think it did a lot of good, because people did go out and buy their own receivers." Both WILL radio stations move to "temporary" quarters in Gregory Hall (where they remained until June 1998.) WILL became known as "The University of the Air," which was literally true. Remote audio lines extended to every building on campus, allowing live broadcast from any classroom. WILL begins broadcasting university athletic events. With an increased emphasis on news and public affairs, WILL starts 24-hour use of the Associated Press wire service. Wilbur Schramm convinces the Rockefeller Foundation to underwrite an ambitious two-week seminar at the university's Allerton House Conference Center. He invites 22 educational broadcasters from campuses across America. That conference becomes known as Allerton I, and its conclusions remain the philosophical cornerstone of public broadcasting. Robert Hudson, a former CBS official, takes over for Josef Wright as director of the Division of Broadcasting. A new transmitter building for WILL is built in Robert Allerton Park. The National Association of Educational Broadcasters begins delivering programs to noncommercial radio stations across America from the basement of Gregory Hall. 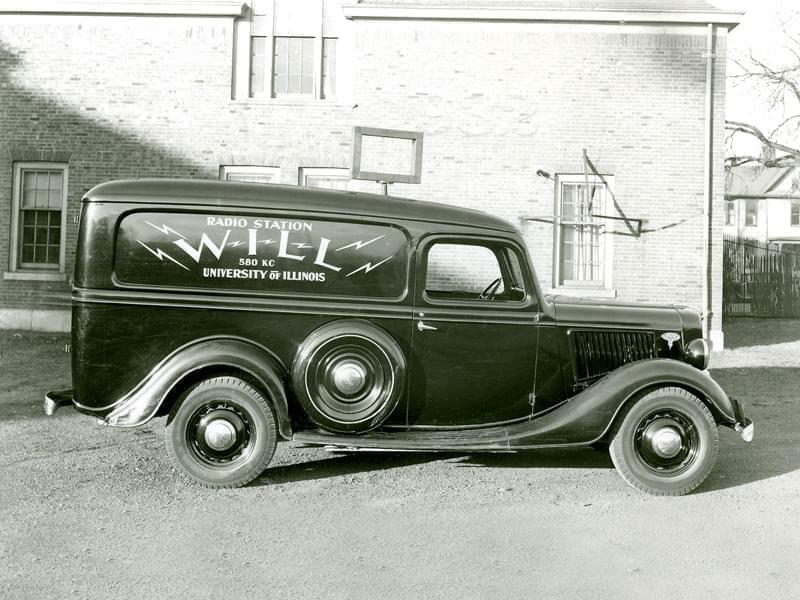 The forerunner of National Public Radio and the Public Broadcasting System, NAEB is given home at the U of I by Wilbur Schramm. The Kellogg Foundation provides the NAEB with a $245,000 grant. First U.S. noncommercial TV station begins broadcasting. The National Association of Educational Broadcasters acquires its first full-time staff director, Harry J. Skornia. He holds the post for seven years. WIUC changes call letters to WILL-FM and moves to present frequency, 90.9. Frank Schooley takes over for Robert Hudson as director of the Division of Broadcasting. WILL-TV begins broadcasting from makeshift studios under the stands of Memorial Stadium. WILL-TV went on the air about 15 minutes later than the scheduled 6:45 p.m. debut. Equipment blew seven fuses so viewers missed the start of the film, "The Finder." Also on the first night was "Your University," with U of I President Lloyd Morey and other U of I faculty and staff. WILL-FM becomes the most powerful educational FM station in the country, increasing its coverage to a radius of 80 to 100 miles. The U of I dedicates WILL-TV. The station's transmitter, which is also dedicated, was given to the university by General Electric Co. in memory of the late William A. Knight, BS '34. Knight, a GE employee, was killed in a car accident following a visit to the campus to interview prospective GE workers. WILL-TV begins broadcasting during daylight hours, with telecourses offered by the speech and French departments. WILL-TV acquires its first videotape recorder, allowing recording and editing of productions. The National Association of Educational Broadcasters moves its headquarters from the Urbana campus to Washington, D.C., to be closer to the campaign to win federal support for the creation of a public television and radio system. WILL-TV goes on air from Main and Goodwin in Urbana. For several years in the mid-1960s, WILL-TV transmitted educational programming from a small airplane flying over Illinois and Indiana. "We had two video transmitters and videotape," recalls Larry Inman, former chief engineer at WILL-TV. "The schools were wired and we flew around in the plane transmitting the shows to the schools." WILL-TV doubles its viewing range to 70 miles with completion of a 1,047-foot tower near Monticello. WILL-TV builds a new studio for color broadcasting (Color broadcasts didn't start for several more years while the station worked on obtaining color equipment). Sesame Street premieres on WILL-TV. Big Bird is perhaps the best known children's character on WILL's stations today. But programming for children has always been a priority on WILL radio and television. "Stories 'n' Stuff," an award-winning program produced at WILL radio for 17 years was carried by 65 other stations; WILL-TV produced several children's programs during its early years including "Olive Lives Here," "Mister Cane," and 15 episodes of an imaginative children 's program, "Tell Me Why," which were shown on educational TV stations across the country. One episode took viewers on a trip through a "fun house" maze than turned out to be a larger-than-life model of a human ear. WILL-FM begins broadcasting in stereo. Before stereo recording or broadcasting were invented, WILL stations recorded special musical events on a two-track audio recorder with the left half of the orchestra on one channel and the right half on another. WILL would play the tape on the air with one channel on FM and the other on AM. Listeners were told how to position their FM and AM receivers to benefit from the stereo effect. WILL-TV begins Saturday broadcasts and fundraising. WILL-FM begins 18-hour a day schedule more focused on music and the arts. WILL-TV begins receiving programs via satellite. The National Association of Educational Broadcasters ceases operations after many of its duties are absorbed by the Corporation for Public Broadcasting. WILL-FM begins 24-hour schedule and WILL-AM introduces an all-information format. Robert C. and Alice Campbell donate $5 million to build new broadcast center to house WILL AM, FM, and TV. WILL-AM begins 24-hour schedule, airing the BBC World Service overnight. WILL-FM installs a translator in Danville, providing a stronger signal at 106.5. WILL-FM installs a translator to provide a stronger signal in Champaign-Urbana at 101.1. WILL radio and television begin broadcasting from Campbell Hall for Public Telecommunication. WILL-TV begins broadcasting 24 hours a day. The U of I dedicates Campbell Hall, Richmond Studio and Swanson Center on September 24. WILL dedicates the Friends of WILL Plaza on October 17. In July, WILL-AM begins 24-hour live audio streaming on the Web of all local and national programs. For the first time, a global audience can hear WILL anytime, anywhere. WILL celebrates its 80th anniversary by creating The WILL Awards: Signaling Excellence in the Community. The first recipients are Carol Reitan of Normal, Citizenship; Ted Peck of Champaign, Education; and John Knoepfle of Auburn, The Arts. WILL-TV begins transmitting a digital signal, with three different channels of content. Mark Leonard named General Manager at WILL AM-FM-TV-Online. WILL Radio begins broadcasting a digital signal, with two, and later three, different streams of content. WILL AM-FM-TV changes its name to Illinois Public Media to reflect WILL’s expansion into the Internet and outreach projects in the community. WILL-TV, WILL-AM and WILL-FM retain their individual names. Illinois Public Media and other public broadcasters in the state launch “Illinois Edition” of PBS LearningMedia, a free on-demand digital library of more than 16,000 research-based videos, interactive images, audio files, mobile apps and lesson plans, for use by teachers and students. Illinois Public Media celebrates its 90th anniversary. Launch of The 21st radio talk show with Host Niala Boodhoo, which brings listeners the news, culture and stories that matter to Illinois. Expansion of The 21st to five markets: WGLT, WUIS, WCBU, WNIJ, WILL. CPB-grant supported Illinois Newsroom launch: a collaboration of Illinois radio stations (WILL, WIUS, WSIU and WVIK) that brings comprehensive news coverage to listeners all over the state of Illinois. Longtime Mid-American Gardener host Dianne Noland retired from the host’s chair in late 2017 after 25 years of service. Tinisha Shade-Spain, whom some viewers may recognize from her time as an anchor and reporter at another local statoin, joined the show in August 2018. Shade-Spain works full-time in economic development in her hometown of Danville, IL, and is completing her certification in the University of Illinois Extension’s Illinois Master Gardener program. 2018 celebrates 15 years of PNC Foundation support for Book Mentors. WILL-TV’s Book Mentor Project supports the literacy, language, math and social emotional skills of pre-school children in Head Start classrooms, homes and day care facilities throughout Champaign County. They work with a team of curriculum experts to select age-appropriate bi-lingual books that meet Illinois Learning Standards and train community volunteers to read those books to Head Start children and then engage them in a teacher-led book-related activity. Children keep a copy of the Book Mentor book for their home libraries. PNC Bank, through its Grow Up Great Grant has funded WILL-TV’s Book Mentor Project since 2011.